Gergeti Trinity Church is a must have to visit destination in Georgia. 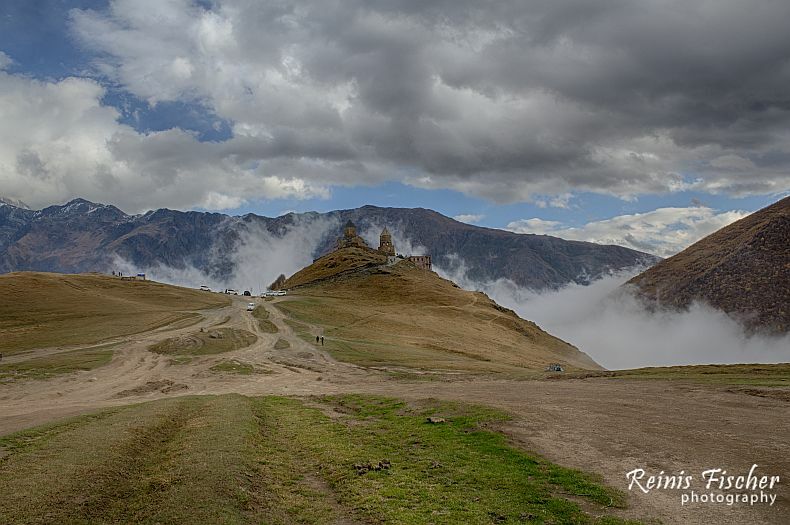 The church is located at an elevation of 2170 meters, under Mount Kazbegi some 160 km North from nations capital Tbilisi. I have visited Gergeti church for some 3 times during my stay in Georgia, and always have hired either Jeep (Lada Niva) or Delica cars to get to the final destination. 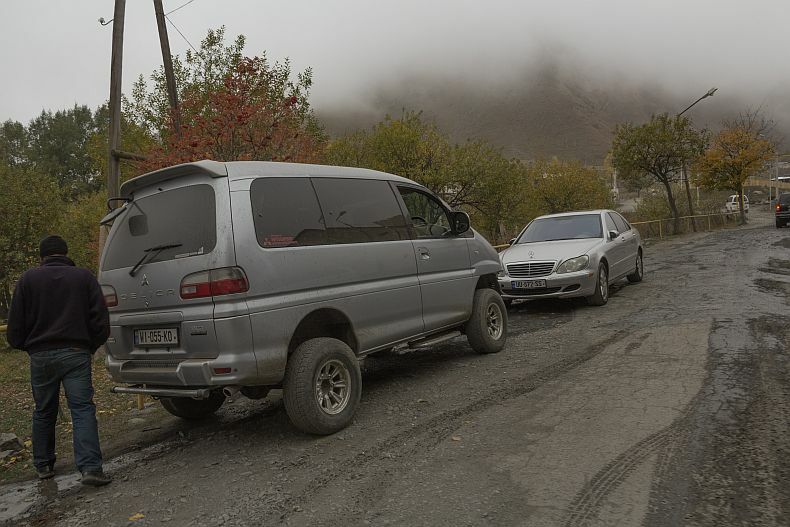 Let me explain - the road until the Gergeti village is pretty fair, but from the village there is a really bad road heading up to the church, and not many will drive up in the hill with their own cars - on the other hand, once at the destination, there are many experienced drivers available with Delica or Lada Niva cars - taking you up for 50-60 GEL (per car, not person). 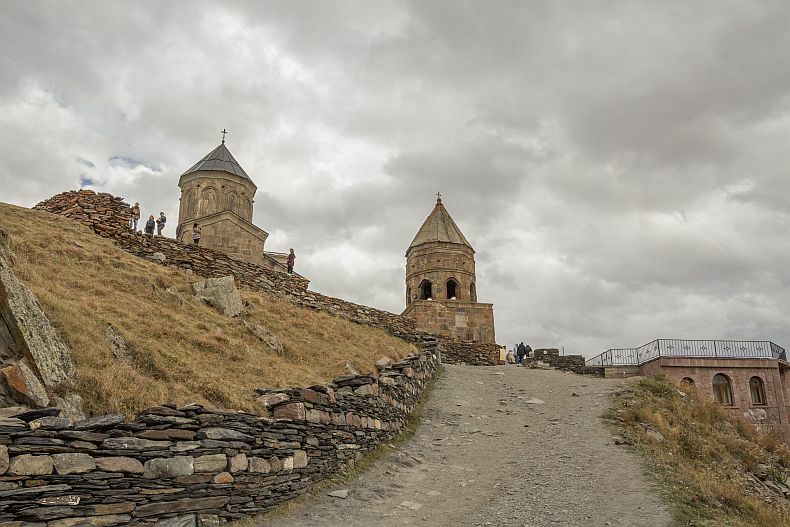 On the other hand I have noticed many hikers there, and actually I wouldn't mind to hike next time to Gergeti church - as I believe it's should be one of the most amazing experiences. Here is a joke from our latest trip - nobody from four of us wouldn't agree to drive up not for 50 lari or 100 US dollars. We hired this Delica car for 4 person group and agreed on price 50 GEL. Some drivers might ask 60 GEL, while others could agree on 40GEL (Prices as of October, 2016). The rumor has it - the municipality wanted to build a ropeway taking tourists up, but local population protested, as it's a pretty good income for taking tourists to the Gergeti church. As of now, there are no plans for constructing such ropeway - but let's agree, that would be awesome. Yup, the most popular car (right side wheel) in this area for sure. Previous time I remember more Lada Niva cars were here. The Gergeti Trinity Church is built in the 14th century, and is the only cross-cupola church in Khevi province. The separate belltower dates from the same period as the church itself. 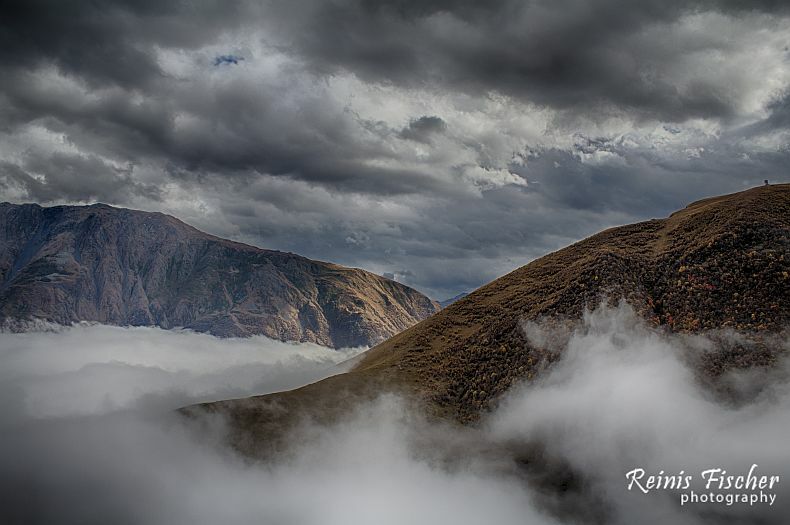 Its isolated location on top of a steep mountain surrounded by the vastness of nature has made it a symbol for Georgia. The 18th century Georgian author Vakhushti Batonishvili wrote that in times of danger, precious relics from Mtskheta, including Saint Nino's Cross were brought here for safekeeping. During the Soviet era, all religious services were prohibited, but the church remained a popular tourist destination. The church is now an active establishment of the Georgian Orthodox and Apostolic Church. 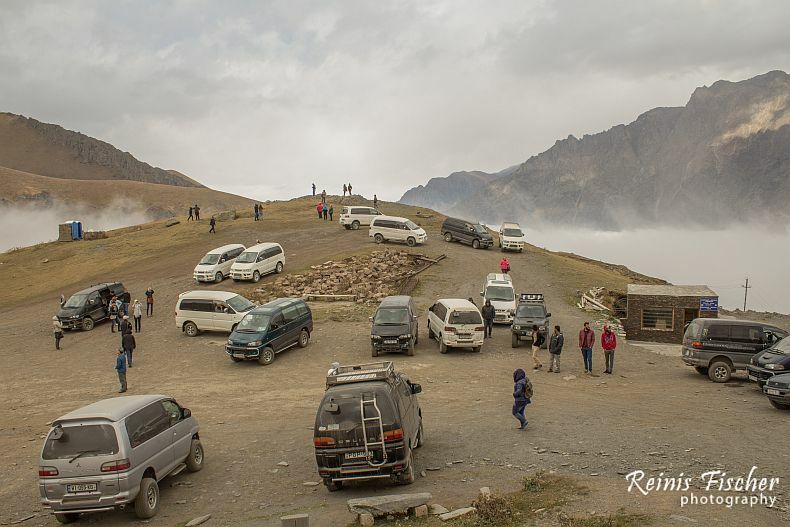 Yup, following scenes are not rare in Caucasus mountains. The church is a popular waypoint for trekkers in the area, and can be reached by a steep 3 hour climb up the mountain.